Depending on where you live, there's a decent chance you're not going to get that white Christmas no matter how often you make the wish. Thankfully, it's much easier to get your hands on a white phone. 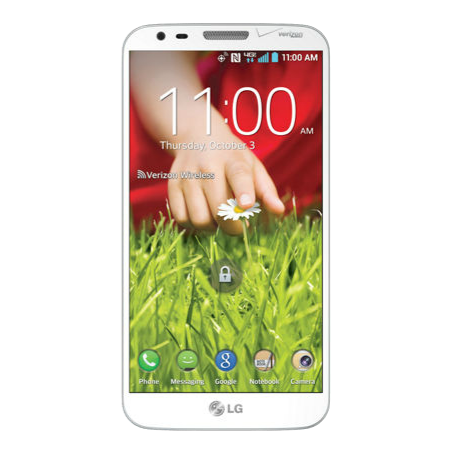 Verizon Wireless is now offering the LG G2 in white, and to sweeten the deal, they're giving it away for free on Cyber Monday. Well, sort of. You will still have to sign away your mobile soul for two years, but for many customers, that's just par for the course. The Verizon G2 typically costs $149 with a new two-year contract, but today's deal strips away that price. In addition, buyers also skip the activation fee and can have the device shipped to their homes for free. But if you want to get the device off-contract, you will still have to pay $499.99. The G2 is also available for free from Best Buy, but Verizon's white version is currently no where to be found there. Amazon has the handset for sale, but it's currently sold out. Right now, your best bet appears to be heading over to the Verizon Wireless site directly, but links for all three are listed below. And if you want a white Verizon phone that isn't the G2, there's always the DROID Mini and Ultra.